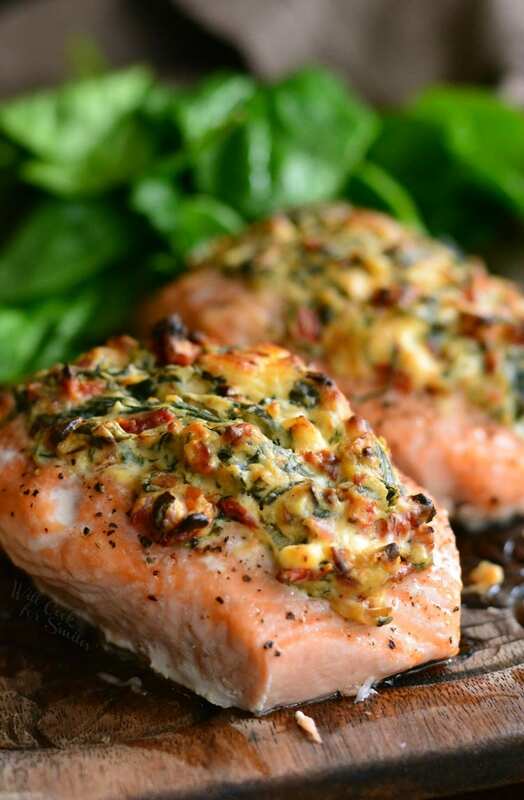 You can never go wrong with salmon for dinner and this stuffed salmon is fantastic. 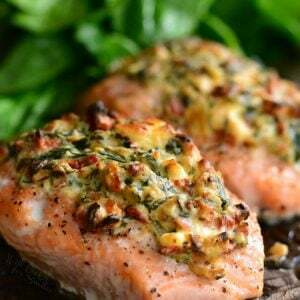 Baked, juicy salmon that is stuffed with an easy sun-dried tomato, spinach, and cream cheese mixture. 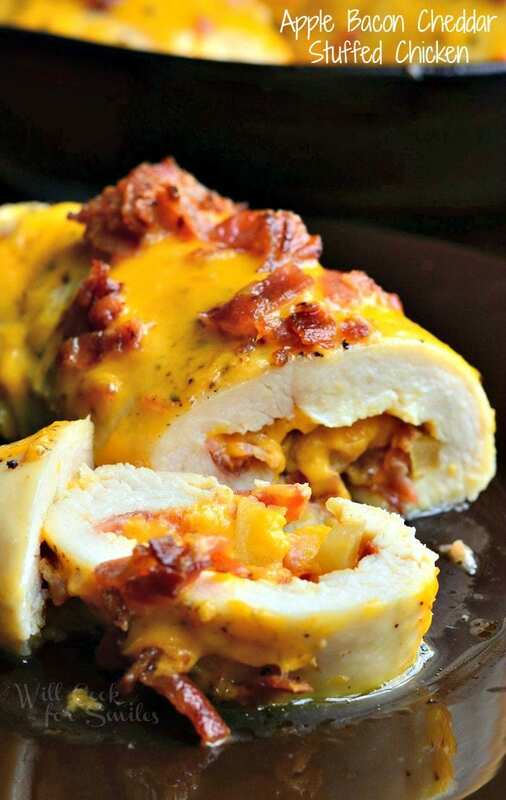 The dish takes about 30 minutes to prepare and tastes amazing! Can you believe that spring is here? Oh wait, it’s still dead of winter for most people. I was getting so excited that we had a cold January but it’s over. It’s all over. Ever since February started, most days have been as high as 80 degrees. This weather makes me think of spring already. My car being covered in pollen and family sneezing like crazy all day are usually the top indicators of spring as well. But, it’s mostly the warm weather and February being half way though. Soon it will be St. Patrick’s Day, and Easter, and Mother’s Day…and oh my gosh, I have to figure out what to get my mom for Mother’s Day. 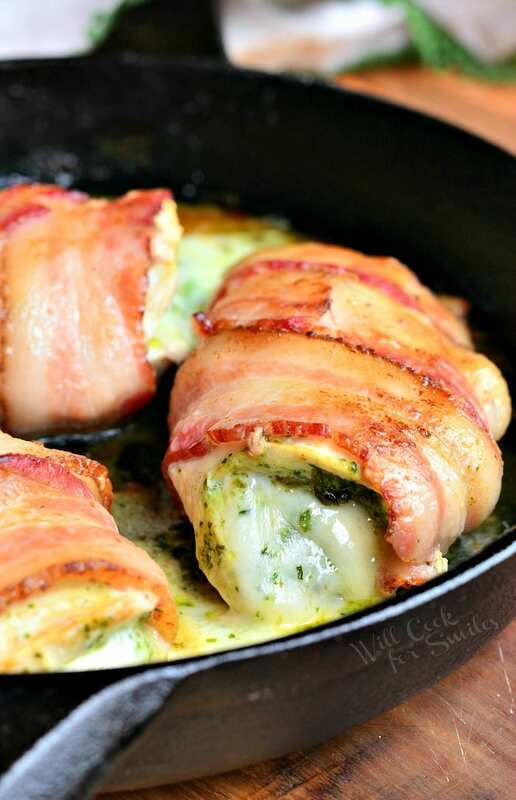 I’m getting off track….I’m here to talk about salmon. 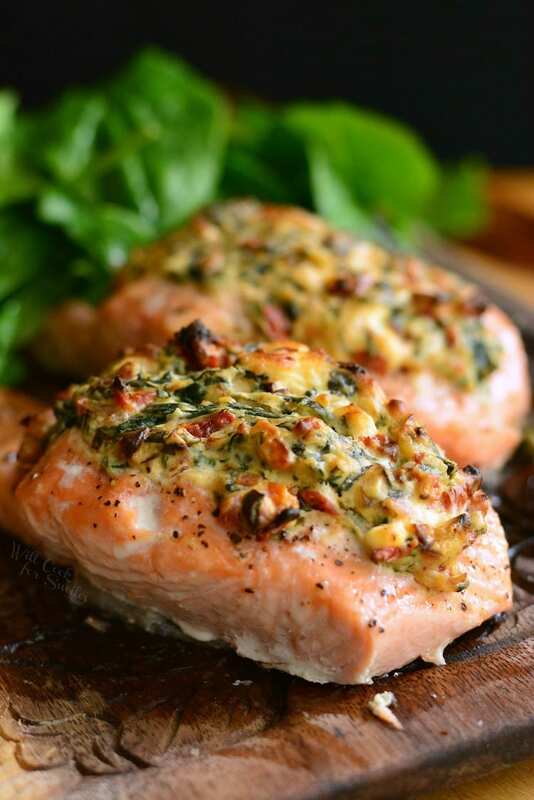 Tasty, juicy, baked salmon that is STUFFED with a creamy mixture of sauteed shallots, sun-dried tomatoes and spinach. 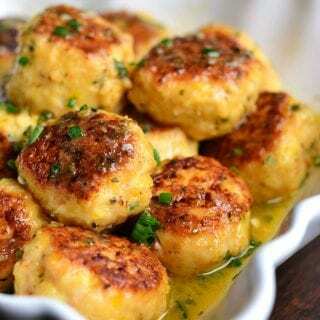 The flavor is outstanding and the texture of salmon with a creamy stuffing is a party for your taste buds. 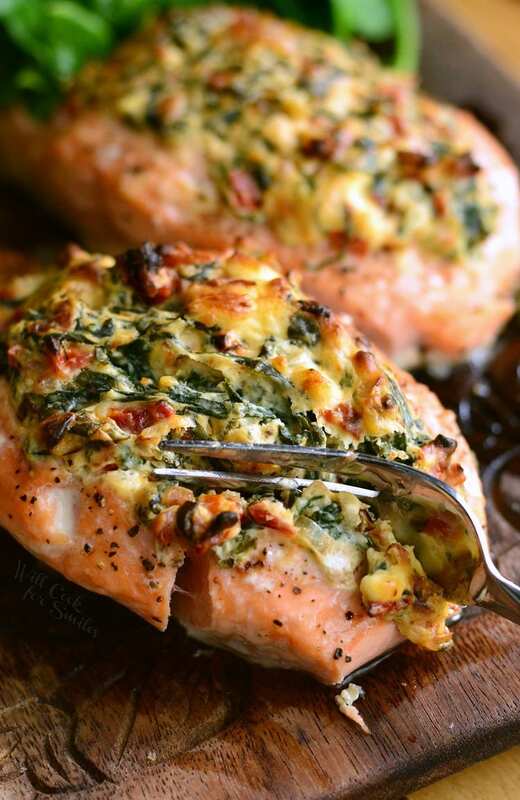 Have you ever had stuffed salmon before? It’s fantastic! My first experience with stuffed salmon was at a fancy-schmancy French restaurant that my husband took us to celebrate our anniversary a few years ago. When I saw Salmon Oscar on the menu and read the description, I knew I had to have it. Once I actually tasted it…I was in love. 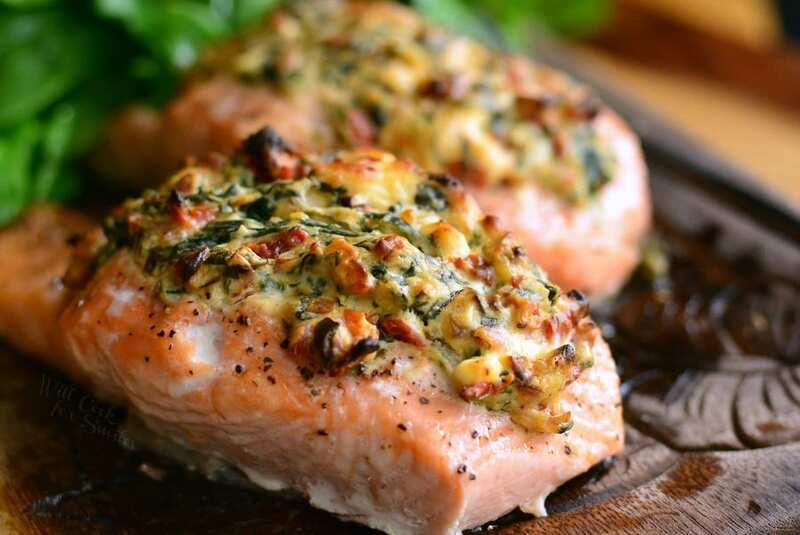 How can you not fall in love with juicy (perfectly cooked) salmon stuffed with crab and a rich cream sauce? Normally, Salmon Oscar is prepared with crab and sauce on top but the chef at his restaurant decided to stuff salmon with the crab mixed with sauce and a bit more sauce on top. It was pure heaven. Since then, I’ve tried making stuffed salmon at home and I just love it. I’m still working on a shrimp mixture to stuff salmon with and once I do, I will share it with you immediately. 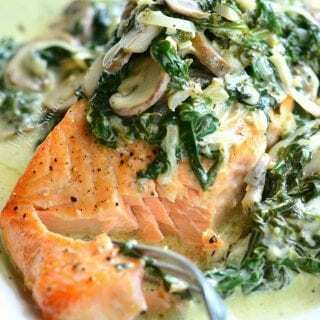 For today, I want to share my favorite creamy veggie mixture stuffed salmon. 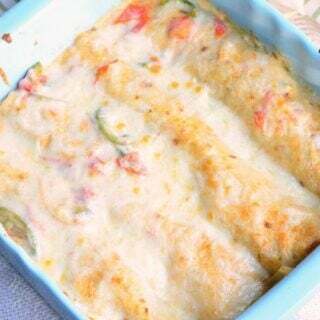 Preheat oven to 425 and line a rimmed baking sheet with aluminum foil. Chop cream cheese into several pieces and place it into a small mixing bowl. Set aside. Preheat a small cooking pan over medium heat. Add a little bit of canola oil for cooking the veggies. Add minced shallots to the pan and saute until starts to golden. Add minced sun-dried tomatoes and minced garlic. Mix and saute for a few minutes. Dice spinach and add it to the pan with veggies. Cover and cook until spinach cooks down. Stir well and season with some salt and pepper. Add cooked veggies to the bowl with cream cheese and mix well, until everything is evenly incorporated. 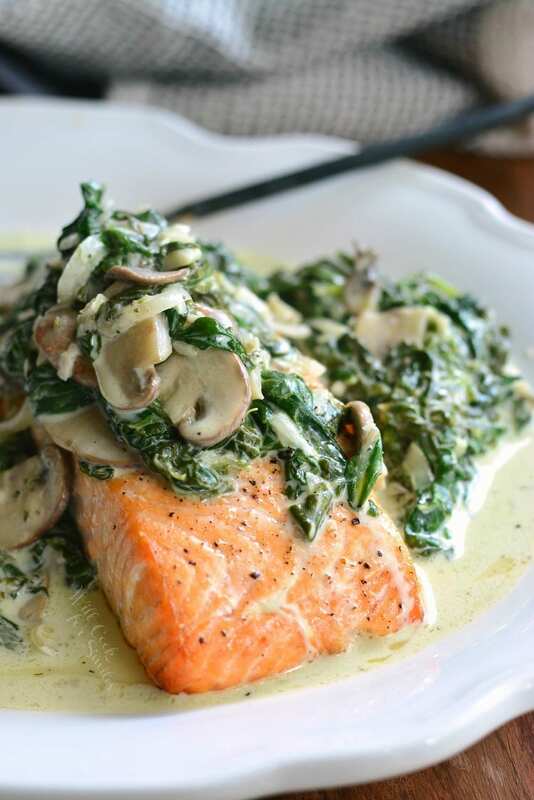 Rub each salmon skin with canola oil and place them skin down on the prepared baking pan. 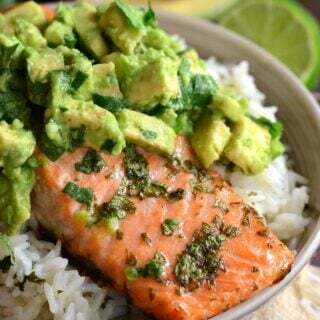 Slice salmon in the middle, lengthwise, but do not cut the skin. Divide the mixture among all 3 (or 4) salmon pieces, stuffing it in the middle generously. 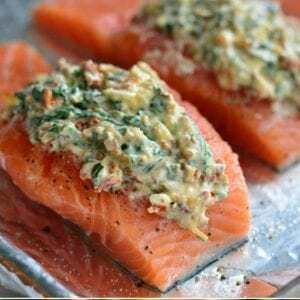 Bake for 18-20 minutes, depending on the size and thickness of salmon fillets. 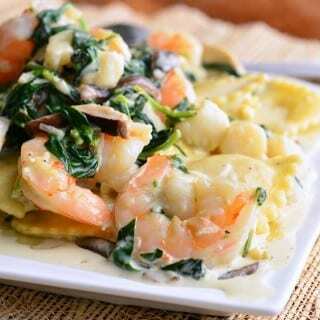 Serve it with a fresh spinach salad or veggies of your choice. Can’t wait to try this! 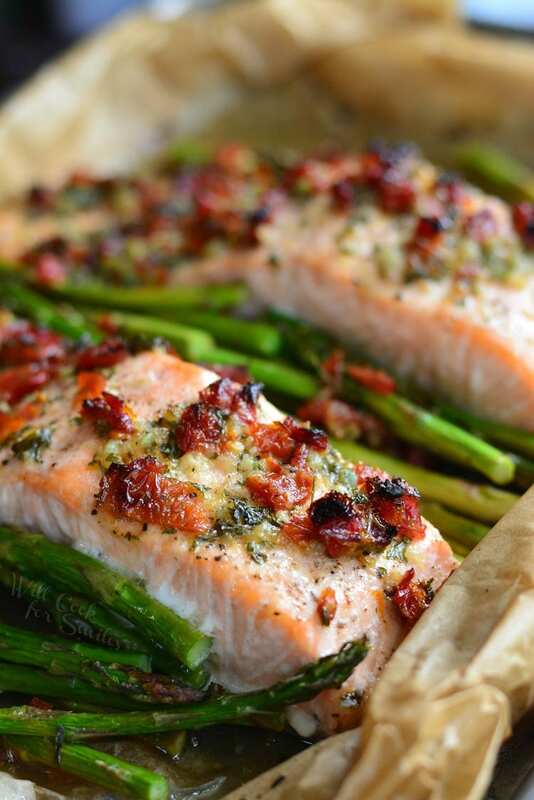 We loved the salmon with sun dried tomatoes and asparagus so I’m sure this will be great! Are you using sun dried tomato in oil? Hi there! No, for this one I used sun-dried tomatoes that come in a sealed plastic bag. 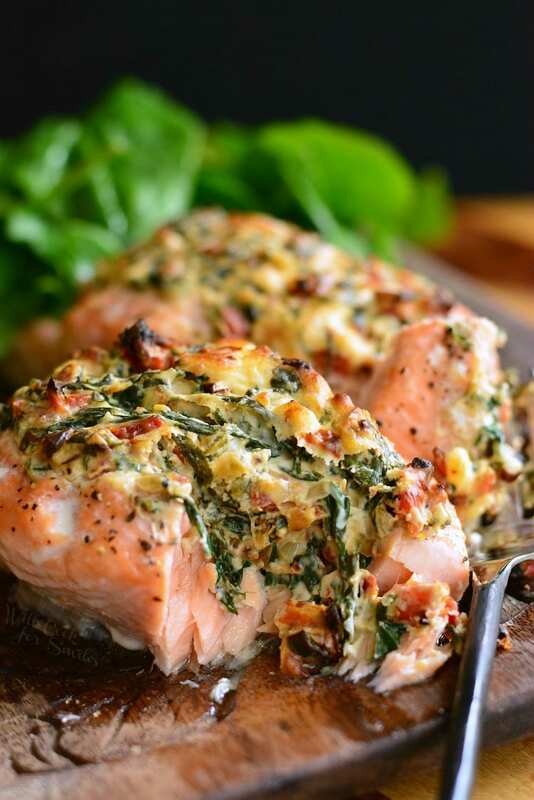 I tried the sundried spinach stuffed salmon and it’s absolutely delicious. I used 4 fillets so basically halved the recipe and it turned out wonderfully. I used sun dried tomatoes in oil (it’s what I had) and this dish was truly excellent. 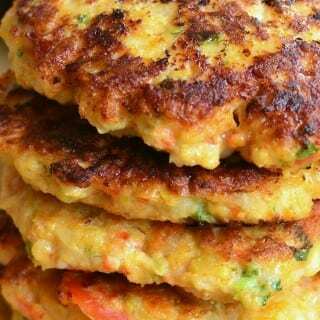 Sophisticated, elegant, simple, tasty, and healthy. Don’t skimp on the salt and pepper though. The wife loved it and I got point through her from the company break room the next day! Might add a few red pepper flakes next time. Thanks for an excellent dish.